Thermal Expansion - Hot Sprue Technology - HotFlo! The hot sprue bush has an operating temperature much greater than the die block in which it is located. Therefore, clearances must be provided for the thermal expansion of the hot sprue bush, in relation to the die. This expansion manifests itself in two directions. This affects the location at both the die parting face and at the sprue bush head. This expansion allowance is included in the Die Machining Dimensions for each standard HotFlo! Series. This affects the position of the end of the hot sprue bush in relation to the die parting line. In the cold condition, the end of the hot sprue bush must be below the die parting line by the amount indicated in the table below. This expansion allowance is adjusted by grinding the Adjusting Ring which is placed under the head of the hot sprue bush. It is imperative that the fixed die half, with the Hot Sprue Bush installed, be tested on the bench before die trialling in the machine. Assemble all the components (hot sprue bush, heater element, thermocouple, adjusting ring and clamping ring) and tighten all bolts securely. Connect the electric power, observing the proper warm-up procedure. When the temperature reaches 450 °C, the end of the sprue bush should be in line with the die face. This procedure also ensures that the element and thermocouple are functioning correctly before setting the die in the machine. If the sprue bush is below the die surface at the operating temperature, measure it and disassemble the hot sprue kit. Grind the Adjusting Ring by the measured amount. If the sprue bush is above the die surface make a new ring increased in thickness by the measured amount. 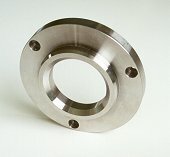 The three bolt holes on the clamping ring are for location only. The rear face of the clamping ring must be in intimate contact with the platen at all times to take up any forces originating at the die face. If there is a gap, forces caused by the die closing on flash or castings will stretch the three bolts causing a permanent gap at the die face. The possible solutions are to grind the back plate on the die or to remake the clamping ring. It is possible that a hot sprue bush may pass the bench testing described above, but still require some further adjustment after the first die trial. This may be due to bedding-in of the components under the force of the die clamping and the machine nozzle force, or to thermal expansion of the die blocks. Also, if a die operates best with the sprue bush at a lower temperature than the standardised 450 °C, there will be less expansion. If it is sufficiently less, it may be enough for the Die Cast alloy to fill the small gap at the parting face and come out attached to the runner as 'flash'. To remove this 'flash' from the runner, remove the sprue bush and grind the adjusting ring thinner by the measured thickness of the flash. Reassemble the sprue bush in the die and it should come out flash free.